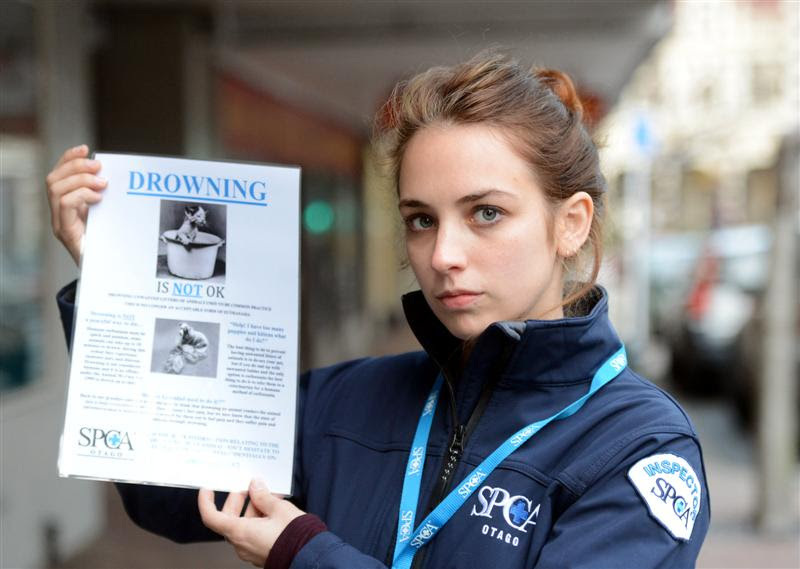 Otago SPCA inspector Rachel Stedman holds a ''Drowning is not OK'' poster, which aims to educate pet owners about being humane. Photo by Linda Robertson. Animal rights advocates have condemned a ''disturbing'' rise in the number of forced animal drownings in Otago this year. The Otago Society for the Prevention of Cruelty to Animals said it was taking a zero tolerance stance to intentional drownings of animals. New Zealand Veterinary Association head of veterinary services Callum Irvine says people who kill animals by drowning ''should be punished to the full extent of the law''. 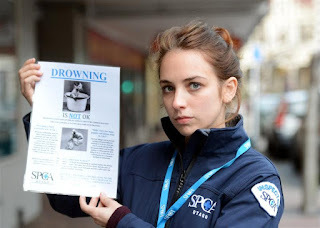 SPCA inspector Rachel Stedman, in Dunedin, said after having to investigate six reported drownings this year - double the number in previous years - they were ''sick of it''. In the latest incident, a member of the public alerted the SPCA to an owner attempting to drown four unwanted, newborn huntaway puppies. As a result, staff were able to respond and euthanise the puppies humanely, Ms Stedman said. ''We rely on people to call us and report acts of animal cruelty and mistreatment so we can stop it and act appropriately,'' she said. Many people were unaware forced drownings were an act of animal cruelty and, as such, they often went unreported, she said. The most common reasons for forced drownings were sick or unwanted newborn litters and ''the odd unwanted adult cat''. People attempted to drown pets in their own homes, with bathtubs and buckets filled with water, as a ''quick fix'' to get rid of them. The misconception that intentional drowning was humane came from older generations who thought it was normal practice, she said. Recent scientific research conducted by Dr Ngaio Beausoleil, from Massey University's Animal Welfare Science and Bioethics Centre, has shown air deprivation of animals causes them severe distress and immense pain. Dr Beausoleil said euthanasia, by definition, meant a good death where the loss of consciousness occurred in seconds. ''Drowning is not considered a good death/euthanasia on the basis of the suffering experienced before loss of consciousness and the time taken for the animal to lose consciousness,'' she said. Alistair Newbould, a veterinarian for Humanimals vet clinic in Dunedin, said causing unnecessary pain and suffering of an animal was an offence under the Animal Welfare Act. Mr Newbould said one of the responsibilities of pet ownership was having to euthanise humanely at the time of need. Drowning was not an alternative to humane euthanasia by a veterinarian. Help was available for those whose could not afford it, he said. Ms Stedman urged pet owners unsure what to do to call the Otago SPCA on 0800 682-467. A person found responsible for drowning animals faced a fine of up to $75,000 or a maximum penalty of three years' imprisonment. SPCA Otago also urged pet owners to desex their cats and dogs.